Lucy Malka, Education Dept. Co-chair of the Thielke/Glen Rock Arboretum in Glen Rock, was one of two recipients in Bergen County to receive the prized Award for Excellence in Bergen County from the Master Gardeners Association of New Jersey (NGANJ)at their Annual Fall Conference held on Oct. 5th at the Rutgers/Douglass campus in New Brunswick. The MGANJ consists of representatives from all current county programs and designated Rutgers Cooperative Extension faculty and staff. 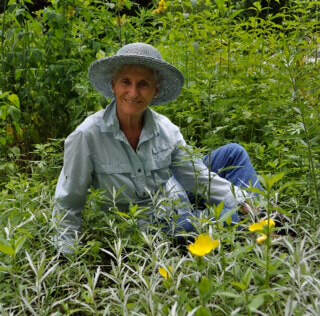 Lucy graduated as a Master Gardener through the Rutgers Cooperative Extension program in 2005 after hearing about the program through a newspaper notice. In addition to attendance in class, MG candidates are required to do 100 hours of volunteer service their first year. Living in Fairlawn close to the Glen Rock border, Lucy dedicated her volunteer time to a designated volunteer site: the Thielke Arboretum on Doremus Avenue in Glen Rock. After spending some time in the fern garden section, Lucy responded to Carol Thielke’s request for docents (guides). Coming from a background as a former teacher, this was a natural choice for Lucy. Under her stewardship, Lucy has increased the number of docents, provided continuous training for them, spearheaded the writing of 5 outdoor classroom programs with the Education Team, and serviced a large number of school children from Glen Rock and other Bergen County communities. To date, from the end of September to the end of October 2013, 209 school children have participated in programs at the Thielke Arboretum as part of their school curricula. Lucy has been further active as part of the steering committee for the Thielke Arboretum summer children’s workshops, the Fall Festival, and Moonlight Walk. In addition to her local work at the Thielke Arboretum, Lucy also is the Garden Club liaison for Bergen County, which entails gathering program information from active garden clubs and disseminating it to Bergen County Master Gardeners through their newsletter, The Potting Shed.